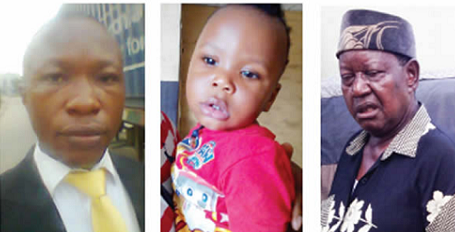 A Lagos-based banker, Princewill Njoku, has accused his father-in-law, Chief Godwin Osochukwu, of abducting his son, Kayomikun, adding that the 69-year-old community leader renamed his child. Princewill noted that petitions sent to the Lagos State Governor, Akinwunmi Ambode, the Lagos State Police Command, the National Agency for Prohibition of Trafficking in Persons and other related matters, and the National Human Rights Commission, had not received attention. However, Osochukwu, explained that he did not abduct the child, saying the 39-year-old did not marry his daughter in accordance with tradition. He noted that he changed the child’s name from Kayomikun, which is Yoruba name, because the two families had no ancestral link to Yoruba. Princewill, who hails from Umuokwaraku Umudiagba Abajah, in the Nwangele Local Government Area of Imo State, however, told Punch Metro that he lawfully married his late wife, Favour Njoku. He said, “I met my wife Favour, sometime in June 2014 and by May 31, 2015, we had our traditional marriage in her father’s compound in Umuokwara Umucheke Okwe in the Onuimo council area. “I went to the village with my people and performed all the traditional rites to marry my wife in the presence of her people. “On September 2, 2015, my wife was admitted to a maternal and child centre at FESTAC Town for bed rest. But when we got there, she was diagnosed with severe pre-eclampsia and we were advised by a doctor that she would have to deliver through a caesarean section that night. He said after signing the operation consent form in the presence of another relative, his wife was delivered of a baby boy, who was named Kayomikun, Chimdinso, Destiny, Sunday, Patrick, Njoku. However, the wife died the following day. He said an autopsy report showed that Favour died from the medical problem earlier diagnosed by the hospital. Princewill said he left the baby in the care of the maternal grandmother. However, on December 27, 2015, he said when he went to pick the child for a thanksgiving service at his church, his father-in-law refused to release the child. “On December 30, my father in-law and some other relatives pushed my sister, Charity Njoku, out of their house and took away my son from my sister staying with my mother-in-law,” he added. Punch Metro learnt that on January 16, 2016, Osochukwu reported a case against Princewill at the Agboju Police Station, Lagos State, alleging that he never married his late daughter. Princewill was subsequently arrested and arraigned in an Apapa Magistrate’s Court, where the banker allegedly discovered that his father-in-law had changed his son’s name from Kayomikun, Chimdinso, Destiny, Sunday, Patrick, Njoku, to Samuel, Ndidi, Destiny, Osochukwu. Osochukwu allegedly sought custody of the baby. The magistrate was said to have asked that the child be brought to court, which the father-in-law agreed to, before later asking for out-of-court settlement. The magistrate reportedly ordered that the baby should be taken to a welfare centre every Monday in order to get acquainted with the father. “The relatives brought my son two times and disappeared. Instead of my father in-law to organise the peace meeting he requested, he went to the police at Zone 9 and lied against me. “I reported the incident to the magistrate in Lagos, who demanded that he should produce my son since May 2016, but he refused. It was at this instance that the magistrate issued a bench warrant on him. “The magistrate, fearing for the safety of my son, requested that we officially report a case of kidnap and abduction to the Commissioner of Police at the Lagos State Police Command, Ikeja, which we did. But the officers at X-Squad, Ikeja, have refused to arrest the man,” he said. Osochukwu, however, denied abducting the child, saying Princewill was lying. He said, “He has not married my daughter. In Igboland, if you don’t marry someone completely when he is alive, you will complete it when the person dies. So, he should do the right thing. “He has not paid the dowry or completed the traditional marriage. We are both from Imo State, but he has refused to allow elders to mediate. Osochukwu, who confirmed that he had reported the case at the Zone 9 Police Command, said he withdrew the case he instituted against Princewill at the Lagos Magistrate’s Court after a disagreement with the magistrate. The 69-year-old, who claimed not to be aware when his daughter was operated upon, said he had been taking the child to the court until he was ordered to take the child to a welfare centre. “I said over my dead body. I told the magistrate that I would not allow that. She gave the order on Thursday and by Friday, we got a stay of execution from a high court. “I am the claimant in the case. After I agreed to settle out of court, I asked my lawyer to withdraw the case, but he refused. I changed the lawyer and asked the new one to withdraw the matter. But the magistrate refused the application. That was when I concluded that I was no longer safe and stopped going to the court. “The names the boy is answering to now are the names my daughter gave him before she died. The name I added was that of my daughter, just to remember her,” he said. Punch correspondent was told that the parties would be meeting at the office of the Commissioner of Police, Lagos State, Fatai Owoseni, on Wednesday (today). The Lagos State Police Public Relations Officer, ASP Olarinde Famous-Cole, said he would get back to our correspondent, but had yet to do so as of press time.